I have an unhealthy obsession with computer keyboards. It all started back in the 1980s. I don’t recall where or why, but I was using a terminal on a large computer system. I loved the keyboard. The keys where mechanical. They made a pleasing click as I typed. I could feel the gentle give as the key made contact, closing the circuit, and a character dutifully appeared on the screen. 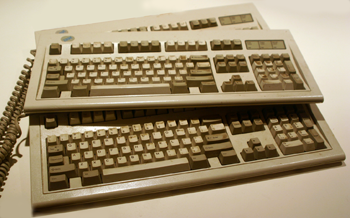 Most computer keyboards are non-mechanical. They use magnets in the key caps to complete the circuit. That setup makes the keyboard feel squishy to me. I can tolerate it, as I do on most of my keyboards, but for my main writing keyboard, I demand something sweet. Above you see a picture of my collection of old IBM, mechanical keyboards. Those metal monsters weigh a ton. I keep them because they are mechanical; they make a loud click as you use them. I love the noise! But more importantly, I enjoy the responsive feel made by the keyboard as I type. That’s why I collected them, why I still have three. Sadly, the old IBM keyboards are incompatible with today’s PC hardware. And they’re huge, heavy, and dominate my computer desk. So I’ve looked elsewhere. The first alternative I settled on was the Das Keyboard, shown above. No, that’s no defect in the image; the key caps are blank on purpose. Supposedly it helps you to be an awesome touch typist. That’s fine, as I’m already a touch typist and don’t look at the keyboard. But for typing key combination, such as Alt+M or pecking the % character, the Das Keyboard proved too tedious to use. Recently, the Das Keyboard people came out with a new, mechanical keyboard, shown above. I love it. Yes, it has key cap logos on it. But the touch and feel is delightfully mechanical. I believe it’s better than that original terminal keyboard I remember enjoying so many years ago — the one that created the keyboard snob in me. The Das Keyboard retails for $99. It’s USB and supposedly works with a Mac, though I haven’t hooked it up to a Mac. Buy it if you like; no link here because I’m not out to make money on the thing, just write. I agree with you here – I’m also a self-confessed keyboard addict. Good tactile response is very important – if it’s a horrible and ‘soft’ keyboard, it just feels like the keystrokes are being registered by a friendly octopus under the keyboard. The keyboard I use most at the moment is the keyboard on my Eee PC 701, and it’s not bad at all: although the key size is tiny, I can usually type with very few errors, and the keys are nice and firm and ‘bounce back’ well. I have a very aggressive typing style, so I need a keyboard that won’t die if I give it a good thrashing. It’s held up very well. I’ve also used Apple’s new USB keyboard (only for a moment, though) and I was pleasantly surprised by how responsive it was – it’s quiet, but it’s very bouncy and you know when you’ve hit a key. Considering it’s now essentially the same as most of Apple’s notebook keyboards, it puts most other portables’ keyboards to shame. I think I used to have a DIN to PS/2 adapter – I did once own a keyboard which (I think) used a DIN plug which had to go into a PS/2 plug. The IBM Model M was undeniably one of the best keyboards of all time, and it’s a shame most keyboards now seem like they’ve had the Airfix logo sanded off the back. I love a good ol’ clickity keyboard. When we got the new computer, the keyboard it came with (and I’m typing this upon) sort of feels like I’m typing with a brick. I have a Microsoft Internet Keyboard on my computer, and it has quite a nice feel to it, too, as do the Dell QuietKey keyboards (granted, not clickity, but still nice). Sadly my clicky keaboard broke. My keyboard is a Logitech Elite keyboard, my second of this type. I used to not like keyboards with lots of shortcut keys and such, but have found that these keyboards suit my needs perfectly. I listen to a lot of online radio and music while I work, so the volume control and multimedia controls are essential. Also, I love having a scroll wheel on my keyboard. It serves two purposes–one, so I can scroll through long documents without having to have my hand on the mouse all the time, and two, if I’m in a hurry to scroll up or down I’ll often roll BOTH wheels (keyboard and mouse) and it goes twice as fast. Also, the keys (while not being loud) have a comfortably solid feel. They don’t just squish down–you put a little weight on them and then they go easily. But it doesn’t feel squishy at all to me. I must confess also, James, that I’m beginning to favor those “extra” keyboard keys as well. At first I didn’t like that they loaded the keyboard with those keys. But on the Mac, the function keys are also mapped to volume control, screen settings, and other handy features. I like that. Dan, I find that the easiest way to clean keyboards (or anything plastic for that matter) is to simply attack them with a pencil eraser. If taht doesn’t work, then you have to really clean them.